You can roast the almonds or leave them raw, depending on your preference. Roasting intensifies the flavor and releases the almond’s natural oils, so you don’t necessarily have to add in oil to make the mixture super smooth. Add in honey or cinnamon if desired, for more flavor. Makes about 1 1/2 to 2 cups. Directions: If roasting, line a rimmed baking sheet with parchment. Add the almonds and spread out in a single layer. Roast for 10 minutes at 350°F. Allow almonds to cool completely before processing. Add the almonds to a food processor or similar blending machinery. Process for one minute then add the salt and process for another 3 minutes. Remove lid and stir, if necessary. Process again. With blade running, drizzle in 1 tablespoon oil. Process for another minute and drizzle in another tablespoon of oil, if necessary. Mixture should be starting to appear smooth in consistency by this point. Add another tablespoon of oil, if desired or necessary. The total process can 10 to 15 minutes. 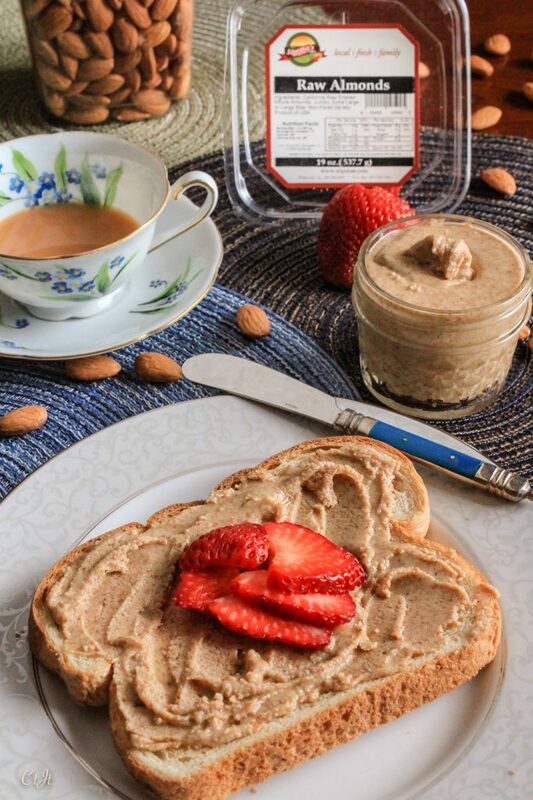 Store almond butter in an air-tight container in the fridge for up to 3 weeks. Leaving it out for about 10 minutes before scooping will help soften the mixture to make for easier spreading.